In Barcelona, IAAC offers an international Master programme in Advanced Architecture (MAA). The MAA is oriented towards architects, engineers and designers from all over the world, eager to imagine the future of our cities and societies and committed to building it in the present. In the version of 9 months (MAA01) or 18 months (MAA02) the Master in Advanced Architecture is accredited by the Universidad Politècnica de Catalunya (UPC) with 75 ECTS and 130 ECTS respectively. The MAA is directed by the architect and researcher Areti Markopoulou. The Master in Advanced Architecture program emerges as an innovative open structure, focusing on four select research lines (X-Urban Design, Self-sufficient Buildings, Digital Matter, Advanced Interaction) all led by internationally renowned experts. These areas of study bring together students and faculty from different disciplines and origins towards the creation of a networked hub of excellence. The IAAC Community dedicates itself to research and innovation for the habitability of the 21st Century. Admission Architecture degree, Bachelor or higher degree from other related professions. Architecture degree, Bachelor or higher degree from other related professions. 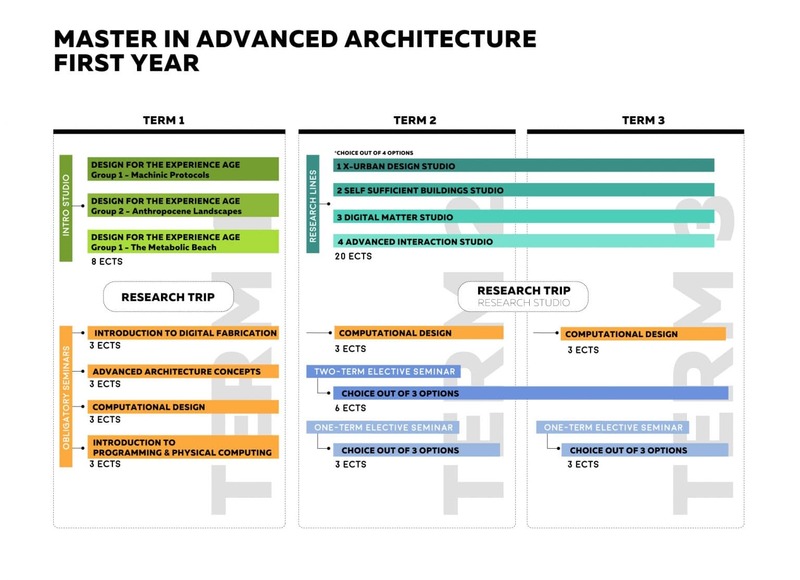 In order to ensure the highest quality of applied research, the Master in Advanced Architecture proposes a multidisciplinary and multiscalar approach. The MAA considers architecture as a transversal field, for which it is imperative to integrate all research and applications with the knowledge of specialists from a diversity of fields of expertise. In this sense, the Advanced Architecture Agenda establishes the responsibility to confront the process of global urbanisation from a multi-scalar and operational perspective, as well as through the development of prototypes that promote environmental, economic and social sustainability. In the early 20th century, the concept of ‘dwelling’ was defined as a ‘machine for living’, a reference to a new way of understanding the construction of inhabitable spaces that characterised the Machine Age. Today, a century later, we face the challenge of constructing sustainable or even self-sufficient prototypes; living organisms that interact and interchange resources with their environment, and that function as entirely self-sufficient entities, similar to how trees do in a field. In this way, each action in the territory implies a manipulation of multiple environmental forces, connected with numerous flows and networks such as energy, transport, logistics, and information. Together, this generates newly inhabitable and responsive nodes with the potential to use and produce resources. Territorial and urban strategies as well as building operations, therefore, call to be coordinated processes that extend architectural knowledge to new forms of management and planning. Multi-scalar thinking also entails an understanding of shifting dynamics, energy and information transmission, and continuous adaptation. Architecture is always facing the responsibility of responding to emergent needs, technologies and ever-changing programmes. We must ask more of architecture: we as architects should be required to design inhabitable organisms that are capable of developing functions and integrating the processes of the natural world that formerly took place at a distance in other points of the surrounding territory. The models created for the metropolis of the last century are unable to accommodate new developments linked to contemporary urban lifestyles, which are ever more discontinuous in space and time. The building-over of the global landscape requires us to project at the same time the full and the empty, the natural and the artificial, and in such a way as to make economic impetus compatible with sustainable development. It is necessary to generate complex knowledge linked to a multi-layered reading of realities that have traditionally been thought of as separate, such as energy manipulation, nature, urban mobility, dwellings, systems of production and fabrication, the development of software, information networks, etc. This opens up the possibility of generating new prototypes, capable of engaging with complex and changing environments. Finally, every new urban or architectural production needs to update its materiality and reinterpret construction techniques of past centuries, which are very directly based on the transformation of locally available materials. It is now time for the interaction between disciplines and technologies to engage in a vision that embraces different fields of research. The Master in Advanced Architecture is articulated in three different programmes: MAA01, MAA01+OTF and MAA02. During the first year (October 2019 – June 2020) the students enrolled in the programmes will work together in a common educational platform, with a common organization and academic structure. After the completion of MAA01, students enrolled in MAA01+OTF or MAA02 will follow two different organizations and academic structures. MAA02 combines the first year Master with a second year of investigation to develop a thesis project. During this second year students are required to deal with a project counting on the possibility to develop it with international faculty and enterprises, highly specialized in different fields. MAA+OTF combines MAA01 with a postgraduate programme called Open Thesis Fabrication (OTF), which is an intensive applied research program that combines Academy and Industry and focus on developing innovative solutions in a wide range of fields. The 10-week introductory term provides a common grounding of knowledge and skills to new IAAC students. It is a formative platform structured by a Design Project and Four Complementary Courses anticipating ideas that will appear during the programme in relation to Self-sufficiency, Design Strategies, Innovative Forms of Planning and Contemporary Culture. A toolbox of both, theoretical and practical skills for further research work. The second term is an open educational structure where the students attend a Research Studio, one Obligatory Seminar of Computational Design, plus two among the three Elective Seminars that they choose according to their academic interests. The second term is divided in three different research lines: X-Urban Design, Self-sufficient Buildings,Digital Matter and Advanced Interaction. Please note: The distribution of students for the Research Studios and Seminars of Phase 2 is done according to several criteria listed in IAAC terms and conditions. The third term is an open educational structure where the students attend the Development Studio, corresponding to the Research Studio they chose in the second term, and three seminars: one Obligatory Seminar of Computational Design, plus two among the several Elective Seminars that they choose according to their academic interests. The third term is divided in four different research lines: X-Urban Design, Self-sufficient Buildings, Digital Matter and Advanced Interaction. Please note: The distribution of students for the Seminars of the Third Term is done according to several listed in IAAC terms and conditions. Phase 4 focuses on the extended research of the Development Studio Project of Phase 3 (13 ECTS credits). The students during this period have the opportunity integrate to their projects more in-depth issues related to the self-sufficiency agenda, as well as the inherent material, organizational and spatial complexities determined by the chosen working scale and the experience gained during the year’s program. The transversal workshop (2 ECTS credits) offered by the Master program is a short-term intensive experience, in which the students work together on collective projects organized by local or invited international tutors. Note: According to academic objectives the transversal workshop could take place either in Phase 4 or in any other phase during the academic year. 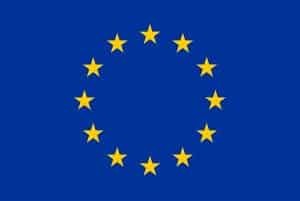 Phase 5 Open Thesis Fabrication (25 ECTS credits, optional). Phase 5 is OPTIONAL and consists of the Open Thesis Fabrication programme. The OTF programme – open to both MAA students and external participants- seeks to develop and complete full-scale prototypes using advanced CNC machinery, innovative material solutions, and smart energy applications. Enrolled participants will be followed by experienced advisors, have special work meetings with leading professionals of the field of digital production, and regular contact with industrial experts. IAAC is organising Lecture Series along the academic year, counting on international invited experts on the fields of Design, Architecture and Technology. The Lecture Series is transversal to the IAAC educational programmes and students participation is mandatory as it is a transversal platform for widening knowledge, generate debates and network with other students and experts around the world. The students during this period have the opportunity integrate to their projects more in-depth issues related to the self-sufficiency agenda, as well as the inherent material, organizational and spatial complexities determined by the chosen working scale and the experience gained during the year’s programme. The transversal workshop (2 ECTS credits) offered by the Master programme is a short-term intensive experience, in which the students work together on collective projects organized by local or invited international tutors. During the first term of the second year the students are proposing their thesis project, that they are going to develop throughout the year, their strategies in the research and design project studio. 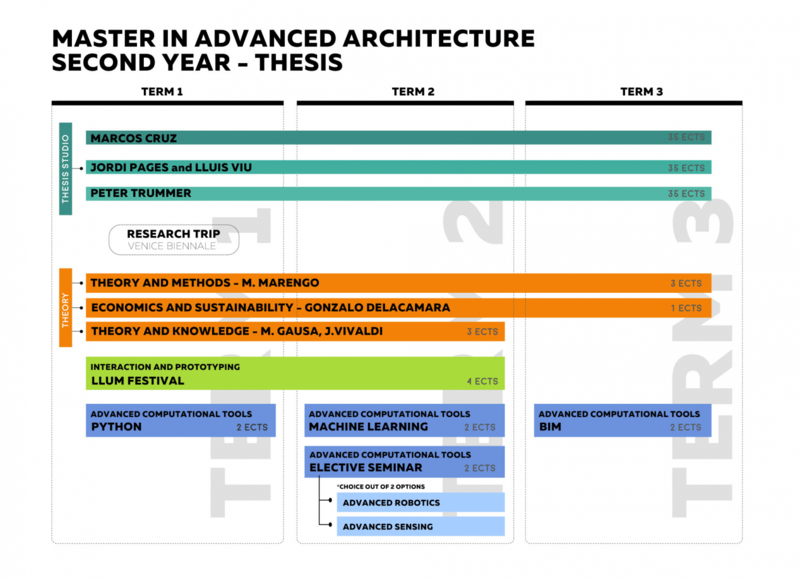 It is a formative platform structured by a Research Design Project and three complementary courses, anticipating ideas that will appear during the programme in relation to the research lines of the thesis themes design strategies, innovative forms of planning and contemporary culture, supporting the theoretical research as well as the practical development of the thesis projects. All classes in this term are obligatory. This period is structured by the Research and Development Studio and four seminars focused on Theory, Advanced Computational Tools and Fabrication. All class in this term are mandatory. This term is structured by the Research and Development Studio and Seminars focused on the practice of the investigation itself. In this term the students are finalising their proposal and constructing prototypes of their thesis projects. All classes in this term are mandatory. Candidates for the Master in Advanced Architecture are architects, engineers and designers from all over the world curious about how the world is changing and committed to driving this change. Therefore the programme is oriented at graduates who wish to commit and develop their design research skills in the context of new forms of practice within architecture and urbanism, ranging from large-scale environments to tectonic details and material properties. Once successfully finished the master, IAAC students will join the IAAC Alumni Community. This is today is an active and dynamic network of visionary professionals distributed around the world, promoting principles and applications of Advanced Architecture, exploring new academic and research initiatives, leading award-winning practices or working for internationally acclaimed firms and institutions. 1. What kind of computational and digital fabrication is possible to imagine for environmental, cultural, social and economic sustainability in architecture? 2. How can these tools be used not only as digital parametric plugins but rather as a new anthropocentric paradigm? A pdf file, A3 format, 3 pages max (max 8MB) containing: a short description in English of the project and the strategy/rationale behind the proposal; images, plans or diagrams of the designed elements.